I fell in to travel writing. I was living in London doing the ‘London working holiday thing’ when a travel magazine advertised it was seeking travel articles. I had recently returned from Turkey where I had gone to the 75th Anniversary of the landing of the ANZACs at Gallipoli and thought to myself ‘i could write an article’, so I did. Before I knew it, I had received a cheque in the post for 25 pounds for the article and was sending copies home to my family and friends. My passion for travel writing was ignited, that was way back in 1990. I spent four years living in London writing travel articles on a casual basis and on my return home to Australia I wanted to continue. I soon found that writing travel guides was my thing. My first travel guide was – surprise, surprise – a guide to a working holiday to London. I had always had it in my mind while living in London because when I went to London I couldn’t find any relevant working holiday information in the bookstores so one cold March morning I found myself at Heathrow Airport with no family or friends, no where to live, no work and wondered what to do next. To rectify this situation for future working holiday makers I wrote the travel guide. I laboured a long time on what to call the guide. It had many names to begin with but none of them sounded quite right to me. One day I sat down and asked myself what is the essence of the book and I answered – it is about living, working and playing in London and the UK – and hence, my series of Live Work & Play working holiday guides was born. First came London, then came Australia, then Japan, Canada and the Republic of Ireland. 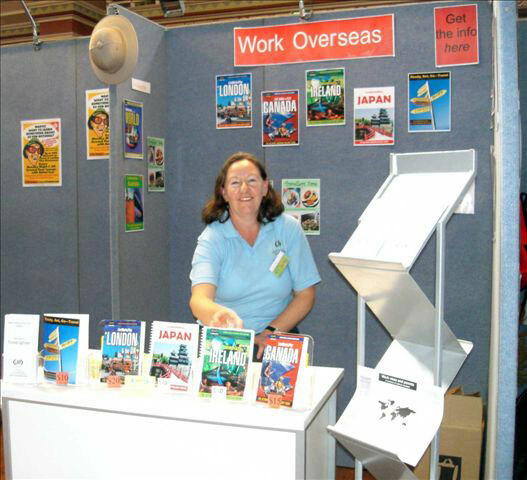 I also wrote work specific guides such as Teaching English Overseas and Work on a Cruise Ship. Most of the guides have been updated and published a number of times. After a hiatus I have decided to awaken my travel guides and launch them all as ebooks. This way, I can ensure they can be updated more often to provide the latest information to future and fellow travellers. Check out all my working holiday guides in the bookstore.